This section presents the comparative before- and after-CWA analysis of worst-case DO data derived using the screening criteria described in Section B and then aggregated by spatial units defined by three scales (reach, catalog unit, and major river basin). In the discussion that follows, the term "worst-case DO" should be interpreted to mean the average tenth percentile DO statistic computed for the corresponding spatial level unless specifically noted otherwise. Also, the reader should note that a worst-case DO concentration of 5 mg/L has been adopted in this report as a general benchmark threshold for defining "desirable" versus "undesirable" levels of worst-case DO. This benchmark value was chosen primarily because USEPA has established it as the minimum concentration to be achieved at all times for early life stages of warm-water biota (see Table 1-1). A total of 311 river reaches had monitoring stations with both before- and after-CWA data, and thus were eligible for comparison. Notably, these 311 evaluated reaches represent a disproportionately high amount of urban/industrial population centers, with approximately 13.7 million people represented (7.2 percent of the total population served by POTWs in 1996). Of this total, 215 reaches (69 percent) showed improvements in worst-case DO after the CWA. Figure 3-9 presents a frequency distribution of the before- and after-CWA data. Figure 3-9 Frequency distribution comparing worst-case DO concentration of evaluated reaches before and after the CWA. 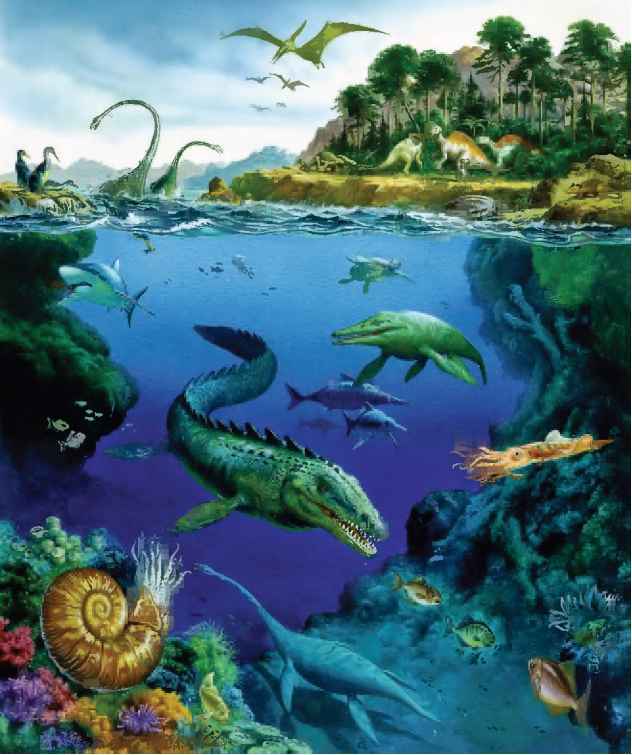 Source: USEPA STORET. • The percentage of evaluated RF1 reaches characterized by "very low" worst-case DO (< 2 mg/L) was reduced from 15 to 4 percent. Before the CWA, 48 reaches had very low worst-case DO. After the CWA, only 13 reaches had very low worst-case DO. • The percentage of evaluated reaches characterized by undesirable worst-case DO (below the 5 mg/L threshold) was reduced from 54 to 31 percent. Before the CWA, 167 reaches had undesirable levels of worst-case DO. After the CWA, 97 reaches had undesirable levels of worst-case DO. • The percentage of evaluated reaches characterized by desirable worst-case DO (above the 5 mg/L threshold) increased from 46 to 69 percent. Before the CWA, 144 reaches had desirable levels of worst-case DO. After the CWA, 214 reaches had desirable levels of worst-case DO. By tracking individual reaches, it was revealed that 85 of the 167 reaches characterized by undesirable worst-case DO before the CWA improved to greater than 5 mg/L after the act. On the flip side, only 15 of the 144 reaches characterized by desirable worst-case DO before the CWA dropped below the 5 mg/L benchmark after the act. Thus, the net change was 70 reaches moving from undesirable levels of worst-case DO to desirable levels of worst-case DO. Figure 3-10 is a column graph that breaks down the 85 reaches that had undesirable DO levels before the CWA and then improved past the benchmark threshold of 5 mg/L after the act according to their before-CWA worst-case DO concentration. 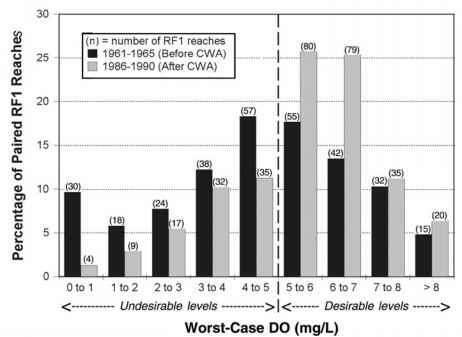 Figure 3-10 Frequency distribution of worst-case DO levels before the CWA for the 85 evaluated reaches that were < 5 mg/L before the CWA and > 5 mg/L after the CWA. Source: USEPA STORET. • Approximately 48 percent of the evaluated reaches (41 out of 85) that had undesirable worst-case DO levels before the CWA and then improved past the benchmark threshold of 5 mg/L after the act had before-CWA worst-case DO in the 4-5 mg/L range. • Approximately 16 percent of the evaluated reaches (14 out of 85) that had undesirable worst-case DO levels before the CWA and then improved past the benchmark threshold of 5 mg/L after the act had very low worst-case DO (< 2 mg/L) before the CWA. • Approximately 36 percent of the evaluated reaches that had increases in worst-case DO (78 of the 215 improving reaches) increased by 2 mg/L or more. • Approximately 15 percent of the evaluated reaches that had decreases in worst-case DO (14 of 96 degrading reaches) decreased by 2 mg/L or more. • Approximately 41 percent of all evaluated reaches either stayed the same or improved or degraded by 1 mg/L or less (129 of the 311 reaches). Figure 3-11 Frequency distribution of worst-case DO for evaluated RF1 reaches that (a) decreased in concentration (n = 96); and (b) increased in concentration (n = 215) after the CWA. Source: USEPA STORET. • All but one of the top 25 river reaches with the greatest before- and after-CWA improvements had before-CWA worst-case DO levels below the benchmark threshold of 5 mg/L. Five reaches had a before-CWA worst-case DO concentration of 0 mg/L. 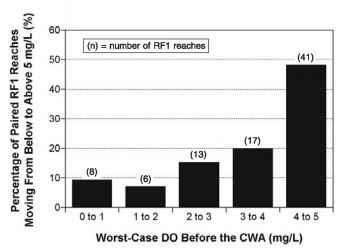 • For 20 of the 24 reaches with before-CWA worst-case DO levels below the threshold value of 5 mg/L, after-CWA worst-case DO improved to levels greater than 5 mg/L. • The four reaches that did not break the threshold value of 5 mg/L after the CWA all had a before-CWA worst-case DO concentration of 0 mg/L. • Worst-case DO in the top 10 improving river reaches typically improved by about 4 to 7 mg/L (from about 0-3 mg/L in the 1961-1965 time-block to about 6-8 mg/L in the 1986-1990 time-block). Long-Term Trend of DO at Reach Scale Time series for dissolved oxygen, averaged over 5-year periods from 1961-1995 and filtered for "dry" hydrologic conditions, are presented in Figures 3-13 through 3-18 for selected RF1 reaches identified in Appendix E with significant improvements in DO concentrations. As documented in the time-series data extracted for the following reaches: Delaware Bay, New Jersey and Delaware (Figure 3-13), Fox River, Ilinois (Figure 3-14), Root River, Illinois (Figure 3-15), Milwaukee River, Wisconsin (Figure 3-16), Maumee River, Ohio (Figure 3-17), River Raisin, Michigan (Figure 3-18), there have been gradual improvements in tenth percentile dissolved oxygen within numerous reaches since enactment of the CWA in 1972. "Before and after" changes in DO for these, and other RF1 reaches, are presented in Table 3-1 with a complete ranking of all 311 RF1 reaches evaluated in this study presented in Appendix E.
Figures 3-19 and 3-20 are maps that display the locations and worst-case DO concentrations of catalog units potentially eligible for the paired analysis for the 19611965 and 1986-1990 time-blocks, respectively. The before-CWA data set contained a total of 333 catalog units. The after-CWA data set had 905 catalog units. • 45 of the 333 catalog units (14 percent) have worst-case DO less than 2.5 mg/L. • 102 of the catalog units (31 percent) have levels from 2.5 to 5 mg/L. • 186 of the catalog units (56 percent) are characterized by worst-case DO greater than 5 mg/L.